The Lion's Roar . . . Tour now extended . . .
Due to the great success last year of our educational show entitled ‘The Lion’s Roar' which toured primary schools in Norfolk, we are extending it's run to allow more schools the chance to experience the show. Now touring Suffork and Cambridgeshire Primary schools too. Here are what schools are saying about 'The Lions Roar' . . .
Mrs Hartopp - Deputy Headteacher - Howard Infant & Nursery School. "Thanks John for a great show. 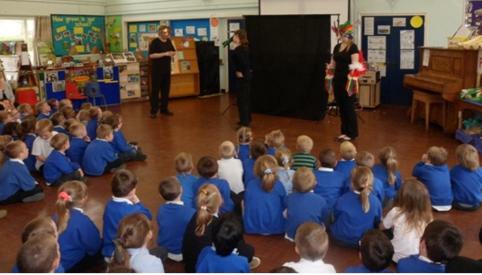 The staff and children who saw the Lion’s Roar at Hunstanton Infant School really enjoyed it. Thank you very much"
"Just wanted to say thank you to John Giller and the Purple Dreams Theatre Company for their fantastic show ‘The Lion’s Roar’. Our students really enjoyed the performance, which was fast paced, fun and educational. The songs and music were great and we especially liked the audience participation. All in all an excellent theatre experience for our school." Tina Humber – Deputy Head Teacher – Reffley Community Primary School, King’s Lynn, Norfolk. 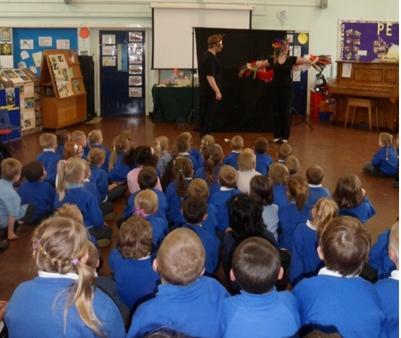 Tour Extended for Norfolk, Suffolk and Cambridgeshire Schools . . .
Purple Dreams Productions have extended the tour of this show. Don't miss out . . . book now! Information about the show . . . This show is based on an African Folklore Story of friendship and honour. Adapted, written and directed by John Giller, (who has been teaching, writing and directing drama and theatre productions for over 25 years) to be both educational and entertaining for children aged 5 – 11 years. Tackling the problems of bullying and antisocial behaviour, with a strong focus on working together, this show plays for approximately 35-40 minutes, dependant on audience participation. Using animal characters, songs and audience participation, this highly interactive show takes children on a journey to help Lion find his roar and in the process turn Crocodile from bad to good with the help of some of his animal friends. The highly skilled actors of the award winning Purple Dreams Productions finish the show with a short question and answer element, ensuring the theme and content of the show is understood by the pupils. This is a real opportunity to have a touring theatre company visit and perform for your school at an incredibly low price of just £270 + Travel*. This amazing offer is available because it is presented in association with JGDATA. So don’t lose out on this educational opportunity, book now. * Travel is calculated at 45p per mile to and from your school. N.B. All actors are fully CRB checked - a copy of which is available on request.